Read through any home selling advice, including MilitaryByOwner’s vast collection, and you’ll find a recurring theme. Curb appeal sells homes faster and for more money. And a substantial part of the overall appearance of your house is the front door and entry way. 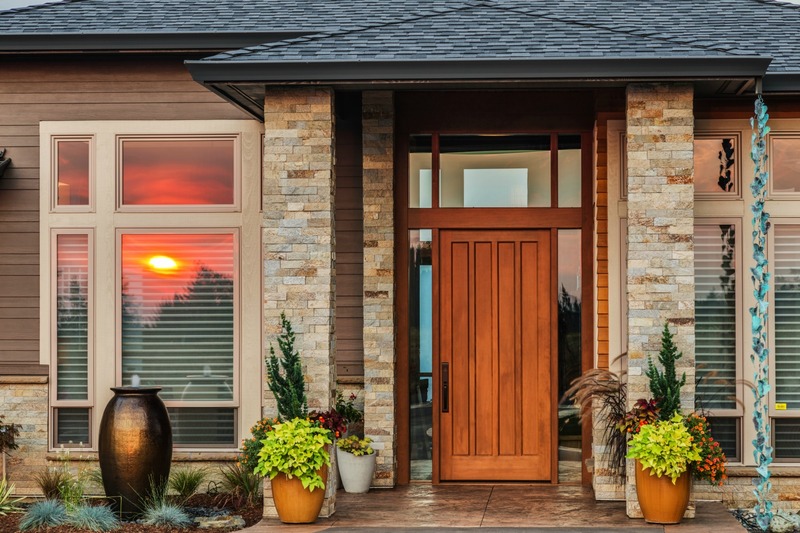 In fact, the front door is so prominent a factor that door manufacturer Therma Tru Doors produced a nationwide study on the return of investment of a new front door. The results stated buyers perceived the house’s worth to be valued as much as $18,000 higher with a new door. 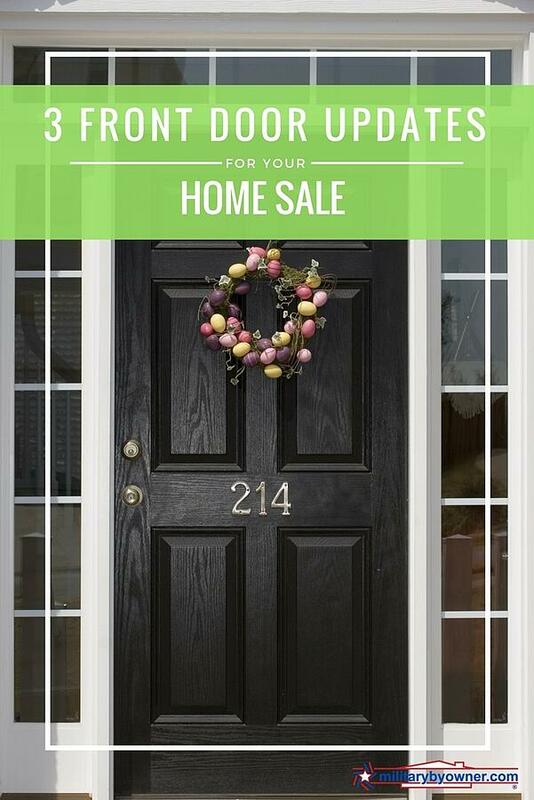 The front door is an easy place to start a curb appeal overhaul for the upcoming home sale season. DIY opportunities are available especially if a simple coat of paint is needed, but a sturdy install of a pre-hung door system or door slab will probably take first-timers at least a weekend. Pros will likely knock the projects out in a day and work around any fitting issues. 1) The biggest project to tackle will be to replace the entire door and framing with a pre-hung system. A pre-hung system includes the door already in place within its own frame and all the parts included. The old framework will have to be removed, both inside and out. Correct measurements are crucial, and adjustments may need to be made to any unlevel wood that the new door will be attached to. Home Depot demonstrates how to take proper measurements. 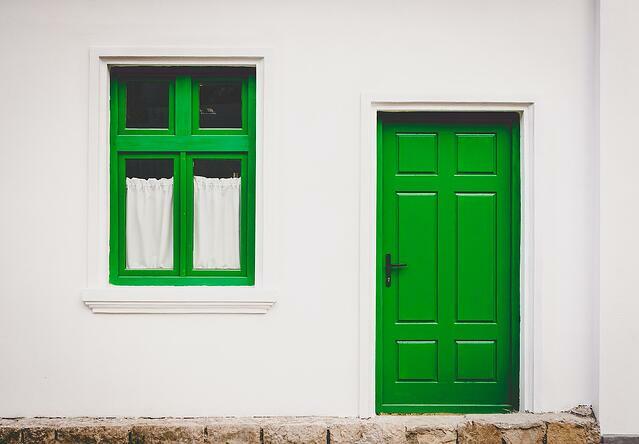 Wooden doors require the most maintenance, benefiting from a new coat of paint or refinish each year. The high-end look is really only maintained if some sort of protection from the elements is available, such as an overhang. Fiberglass is a good choice for durability and the wide array of options. It also withstands a multitude of climates well with little upkeep. Steel is durable, affordable, and very strong. Homeowners who prefer little maintenance will be happy with this choice. 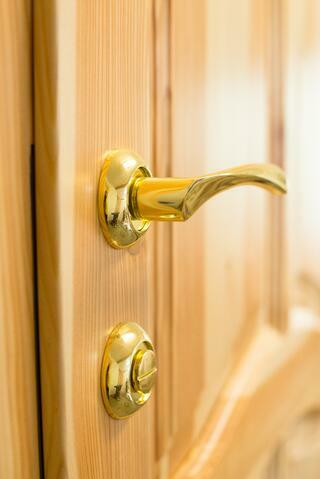 All types of doors can be upgraded with glass inserts and other decorative hardware, such as knockers. 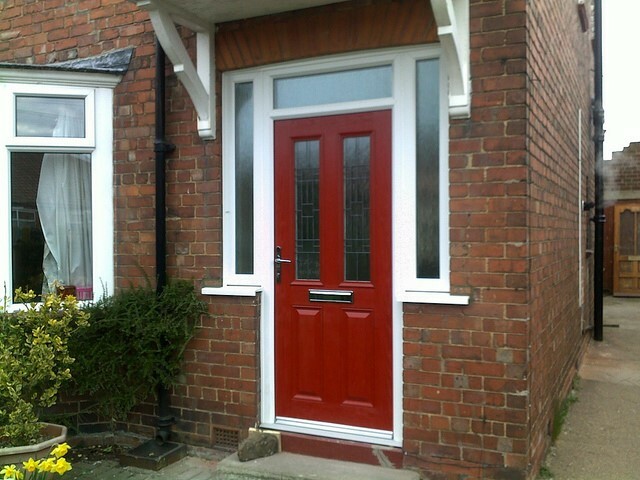 The door’s function and surrounding areas must be taken into account when preparing to buy new. A logical configuration of the door is important. Single, double, and doors with sidelights are options. The best configuration takes into account budget, space available, and functionality. The direction the door opens is either called an inswing, toward the inside of the house, or an outswing toward the outside. Inswings are most prevalent, but outswings are available. Door handing is the term used to describe which way the door swings and where the hinges are located from the view of the door from outside. There is a left-hand swing and a right-hand swing. Panel types and glass selections are decorative ways to bring personality and interest to the look of the door. Depending on the choice, they may even provide energy savings. Lowe’s provides an easy to watch tutorial about installing a pre-hung door. 2) If the door frame is in good working order, replacing the door slab is a cost-effective way to update the door’s appearance. A door slab refers to the actual door, without any framing pieces or hardware. Jeld Wen Windows and Doors recommends taking the following measurements to buy the correct size door slab. “Take three horizontal measurements and record the smallest measurement. This is the width. Take three vertical measurements and record the smallest measurement. This is the height. Measure the hinge width and height. Remove the door handle (and deadbolt if it exists) and measure from the top of the door to the center of the bore (the hole). Although to the novice it seems like buying and installing a new door slab is simple, it is not easy. Exact measurements for drilled holes for hinges, locks, and handles are necessary, as are specialized tools for cutting holes. 3) Painting is certainly the most time and budget friendly of the door upgrade options, but the time allotment for ideas about color, removal, paint prep/dry and re-hang is probably longer than an average DIY'er considers. Although you’ll be tempted to paint the door on the hinges while taping off the hardware to save time, the quality of this technique is lacking. Prepare the door for painting by taking it from the hinges and removing all hardware. If new hardware is in the plan, shop days before the actual painting occurs. Picking a color is personal, but for selling, it’s about what the buyer would like to see. Buyers want charm and neutrality. It's best to take cues from a paint store about which colors are best sellers in your town and look for colors that are paired well with the date or style of your home. Experts also suggest using semi or high gloss paint to inhibit mold and mildew growth. Take in consideration the surrounding colors from the exterior of the home and the natural colors found in the front yard. Clean the door and sand so the primer will adhere easily. Use a tack cloth to remove dust and tape off any glass that is not to be painted. Remove all hardware. Apply the primer, remembering a tinted primer might be useful if a dark color needs to be covered or applied. After the primer dries, inspect to see if additional light sanding is needed to even the surface. Wipe with tack cloth once more. After the primer has dried, begin to paint the details and edges of the door with a brush. Later, a six-inch roller will come in handy to apply paint to the flat surface. The paint will usually need a full day to dry and cure before it’s safe to re-install the hardware without marring the finish. The last and final step of updating the front door is to add accessories to the entire entry way. A beautiful new door needs to have complementary pieces like new lighting fixtures, mailbox, and planters. A front door is only the beginning of updating curb appeal, but it certainly will, at minimum, help to drive buyers in, potentially purchasing the house at a higher asking price. For even more advice for selling your home at the best price, read all of the free home selling articles MilitaryByOwner has available.